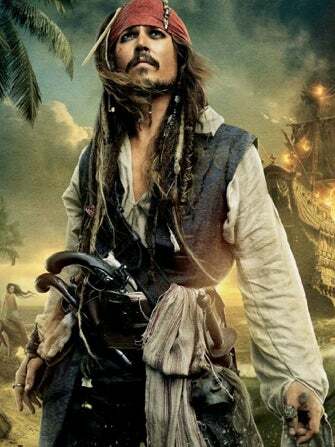 Personally, we'd be reluctant to quit any job that regularly delivers $20 million paychecks, but maybe it's that old-fashioned attitude that separates us from the geniuses of the world like Johnny Depp. After a long and rich history in Hollywood, Tim Burton's favorite frontman recently told the BBC that he is thinking of getting out of the acting game — or at least, we think that's what he meant. Depp sounds a bit jaded and frustrated, saying that "when you add up the amount of dialogue you say per year and you realize you've said written words more than you've had a chance to say your own words, that becomes an insane option for a human being." True, we can see how doing as many movies as he does these days would get very overwhelming. But that frustration does not mean he'll be turning his nose up at Alice in Wonderland 2 or a fifth installment of the Pirates of the Caribbean franchise. When asked about the two upcoming blockbusters, he simply said, "I think we're alright in those categories." Depp goes on to get really coy, noting that he would like to do "quieter things" in the future. "Yes, I wouldn't mind that. I wouldn't say I am dropping out any second, but I would say it's not too far away," he hinted. The truth is, we can't be sure whether by "quieter things" he means activities like needlepoint and making homemade preserves, or just a return to the more artsy films of his past. And while we'd love to watch him pursue a career as a purveyor of hand-knitted mittens on Etsy, we'd be very sad to see him leave the big screen. Do you agree?